These two projects quickly helped me make a dent in my Christmas present knitting. I don’t know who the bag will go to, but I made the scarf especially for a friend of mine who lives up north and can get the full use out of a scarf. Here is a close-up of suki, jr., who will most likely be felted this evening (I’ll show you a before and after later). The colors are so pretty (thanks Matt!). 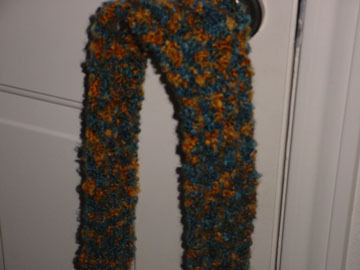 And, here’s my quick Lionbrand Boucle’ scarf, which is really fun and textured. Today, it finally got cool enough around here to curl up on the couch and finish Grover. 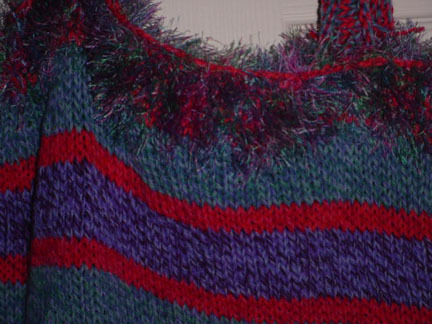 Since today was the first day it got cool enough to wear such a sweater, I am motivated to get it wrapped up. I’ll keep you posted.